I meet up with Teresa and her daughters to go for a walk after messy play and byob at the Linden centre. I ask them to choose a walk that they might usually do to share with me. They decide that we should go down past the castle to the playground by the Nordic centre. Jasmine is only two, but she doesn’t go in the pram anymore – her sister Brianna, who’s just turned one, has the pram. Teresa tells me that she tried with a double buggy for a while (the girls are only 18 months apart in age) but it wouldn’t fit in her flat, and Jasmine wanted to get out and walk all the time anyway. As we walk we talk about Huntly, Teresa has only lived here for a year, but she’s known it all her life. She chose to be here partly because it’s so walkable – it has everything that you need pretty much, and yet is small enough to get around. That said, Jasmine can’t walk all that far – Tesco and Asda are too far for her, so Teresa just gets a big shop delivered and they can walk to Costcutter for stuff in between. We agree that supermarket delivery is great (I don’t have a car either). We talk about the cost of running a car, and the cost of taxis and bus fares – and how different they are. We agree that having a car would give you freedom to just go wherever, whenever. Teresa tells me that she used to live out in the countryside, and had 5 dogs, so daily walking was an important part of her life then – and that she loved to walk. Taking the dogs into the forest, and just going with them for a couple of hours. Walking like that – walking out into the countryside doesn’t seem possible at the moment, but she’d like to get a dog when the girls are older and walk with them. We talk about the landscape around Huntly, how the hills surrounding the town sort of invite you for a walk. We talk about the baby slow marathon that I did last weekend, up the Clashmach. We talk about awkward points in Huntly for walking with a pram. Teresa says there’s a stretch of Gordon Street near the Bargain Box charity shop that has a terrible camber to it, so the pram almost tilts and it hurts your wrists to keep it on the pavement. If she does have to go that way she always walks on the other side of the road. We stop at the playground for a bit for Jasmine to have a run around. We walk the prams around the playground following her as she runs from the slide to the swings to the see saw to the skateboard ramp. We talk about breastfeeding, and about sleep, about toddlers eating (or not eating), and about cooking for vegans. We talk about the challenges of being a parent and setting boundaries, and whether its easier or harder if you’re on your own with kids. We set off to walk back before Jasmine runs out of energy. 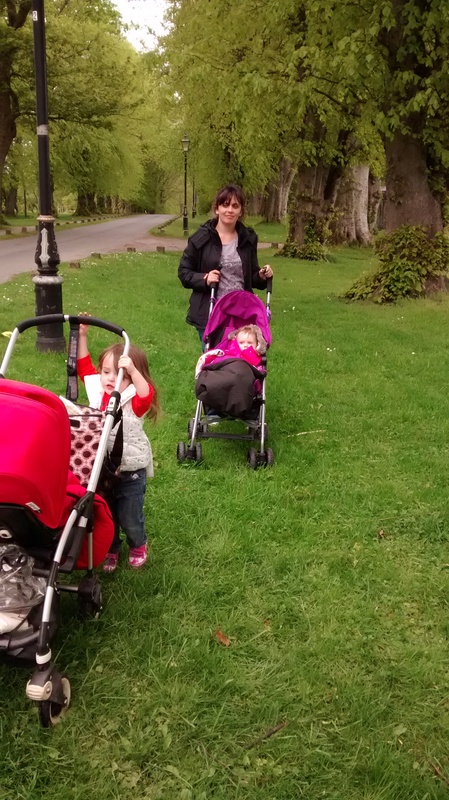 We talk about how slow it can be to walk with toddlers (Jasmine is very good and although she stops to look at lots of things along the way, she mostly holds onto Brianna’s pram, or Ruby’s pram, and walks along with us). Terea tells me about her Granddad who lived in Huntly, about walking along the river with him. I mention the idea that came up during my walk with Janice and Robin about getting the Huntly strong man competitors to carry prams along the riverside path. We agree that it would be spectacular. I resolve to try and work on making it happen. We say goodbye at the junction of Eastpark Street and Castle Street, Ruby has just fallen asleep, having been a little grumpy for the last 5 minutes or so.